While I usually make cakes, everyone needs a go-to easy vanilla cupcake recipe. Cakes take so much time to make and decorate, but cupcakes come together in a flash!! Or at least that’s I feel about them. Cupcakes also are so much easier to eat. Cakes have to be sliced, you need plates and forks….but cupcakes? You just peel back the liner, and dive right in! Another benefit to having an easy vanilla cupcake recipe up your sleeve? It’s the perfect starting point for so many different flavors of cupcakes! 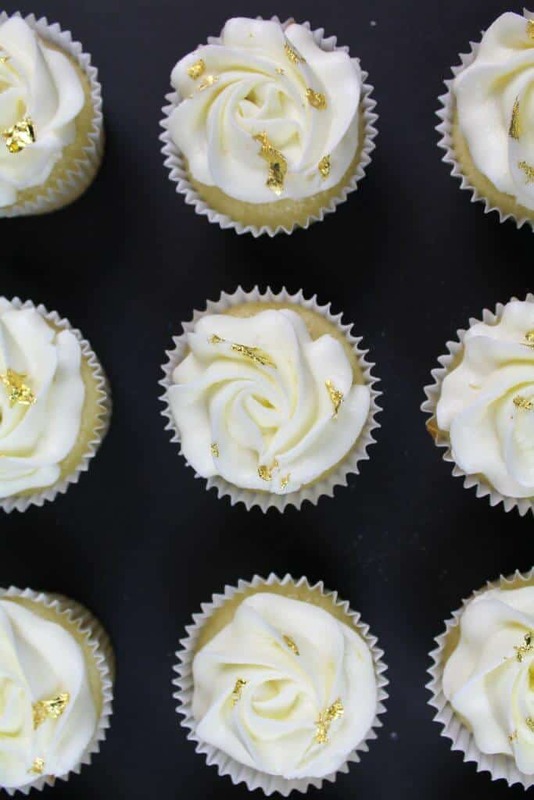 You can add in different extracts, fillings, or frostings, and transform this base recipe into a million different cupcake flavors. Want a lemon cupcake? Throw in some lemon zest, and swap the vanilla extract with lemon extract! Need to make a strawberry cupcake? Fill the center with your favorite strawberry jam, and top with a strawberry buttercream!! See what I mean? Once you have a foundation recipe you love, it’s so easy to alter it to create whatever flavor of cupcake you want. While we’re on the topic of flavors, if you’re more of a chocolate person, I highly recommend my moist chocolate cake recipe. It also comes together in one bowl, and is packed with chocolate flavor. A notable ingredient in this vanilla cupcake recipe? It uses BUTTERMILK! I don’t know what is is, but I’m absolutely crazy about buttermilk. I love baking with it, and use it in most of my recipes! It makes such a tender crumb, and adds so much moisture! It also gives my cupcakes a delicious tang. While buttermilk can be found in most grocery stores, some parts of the country or foreign countries don’t sell it! If you’re having a hard time getting your hands on buttermilk, don’t worry. You can make your own buttermilk! For each cup of buttermilk that the recipe calls for, use 1 tablespoon of white vinegar or lemon juice plus enough milk to fill 1 cup. You also can use plain, low-fat yogurt as an equal substitute, cup for cup! My absolute favorite part of this recipe? It can be made in one bowl! That’s right, you add all your ingredients into one bowl, give it a good stir, and pop these into the oven.I hate making extra dishes, and always try to keep things as simple as possible when it comes to baking. This recipe can also be made by hand, so no need for hand or stand mixer needed! Just a big ol’ bowl, and a wooden spoon (or at least that’s what I use)! While the texture and taste of the cupcake is very important, I’d argue that the frosting / decoration on top of the cupcake is equally important. If you have a frosting recipe you love, by all means, top these cupcakes with it! I usually frost my cupcakes with a half batch of my vanilla buttercream. It’s definitely a sweet frosting, but it is my absolute favorite! It only uses 5 ingredients, and is also super easy to make. I usually make it ahead of time, to make life easier! My buttercream frosting keeps in the fridge for up to a month in an airtight container. Just be sure to give it a good stir before using it, to get rid of any air bubble that may have formed while it came to room temperature. While I do enjoy mixing up my cupcake decorations, the frosting tip I use the most is my Wilton 1m tip (open star). This frosting tip pipes those beautiful and classic swirls that we know and love! 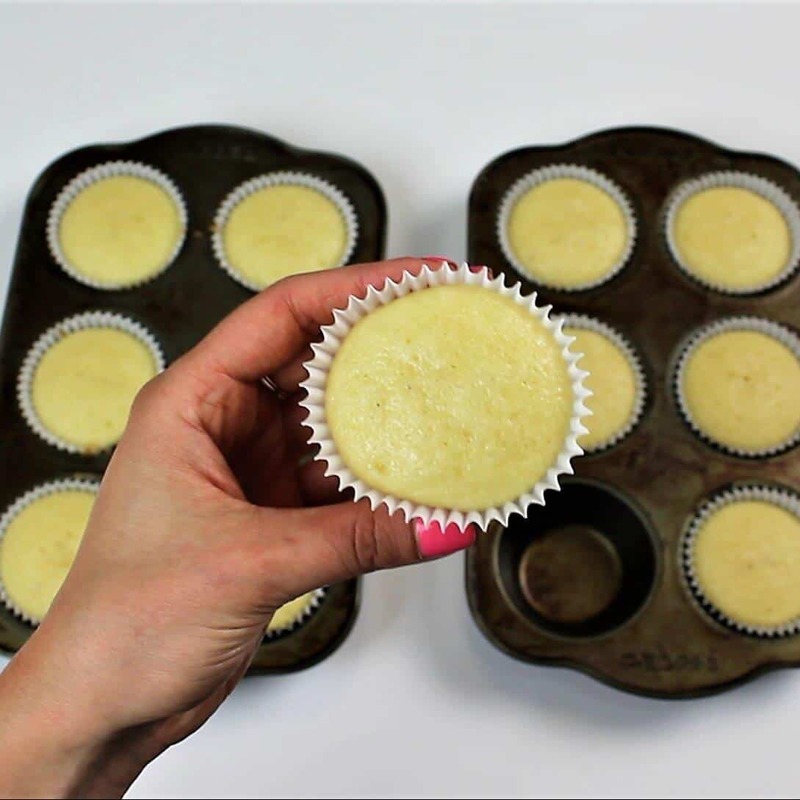 Begin by preheating oven to 350°F (175°C), and place cupcake liners in baking pans. Add the flour, sugar, baking powder and salt to a large bowl, and gently combine with a large spoon. Pour in the buttermilk, and gently stir until just combined. The batter will be very thick, but that’s ok! Next, add in the water, vanilla, eggs and vegetable oil, and mix until the batter comes together. Fill the cupcake liners about 2/3 way full. 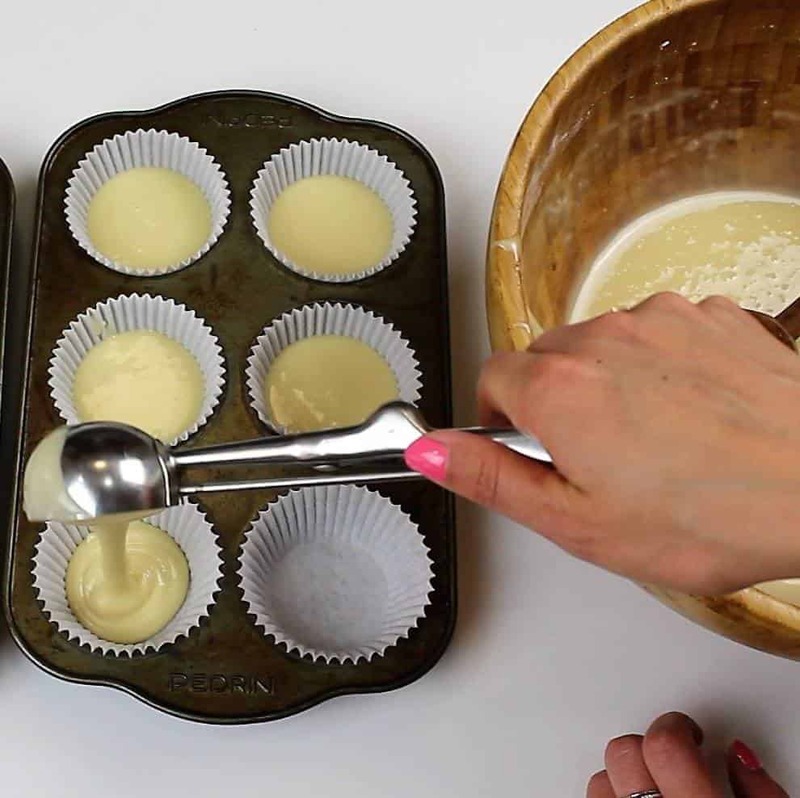 I like to use an ice cream scoop to do this, to make sure I add the same amount of batter into each cupcake liner. I find I can make 12-14 cupcakes using this recipe, depending on slight variations between cupcake pans and liners. Bake for 17 minutes, or until a toothpick comes out clean. Allow the cupcakes to cool for 5 minutes before moving them to a cooling rack to finish cooling. If you want to accelerate the cooling process, pop the pans into your freezer for about 30 minutes. While the cupcakes bake and cool, prepare the vanilla frosting as instructed in the recipe below. Once the cupcakes are fully cooled, add a large swirl of buttercream. I used a Wilton 1M tip, but you can use whatever you prefer! If you don’t have any frosting tips, you can always use a ziplock bag and just trim the tip to have a 2 cm opening. 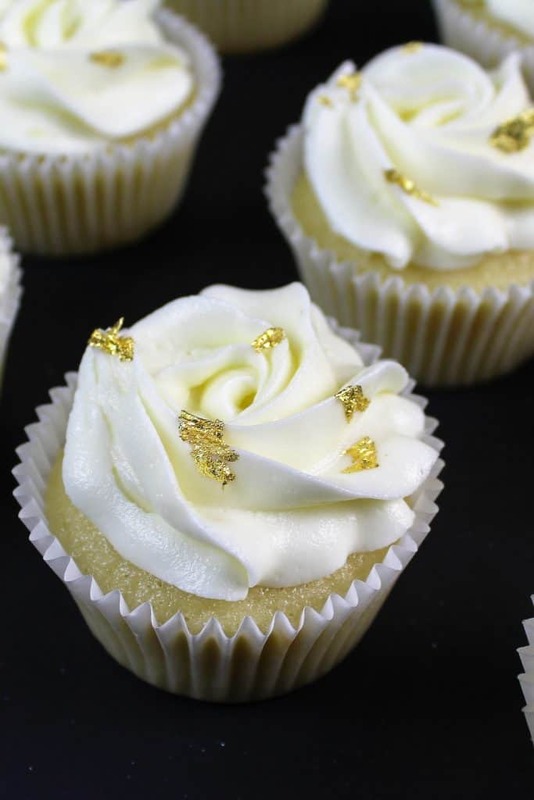 I also added a bit of gold leaf to these cupcakes to jazz them up! 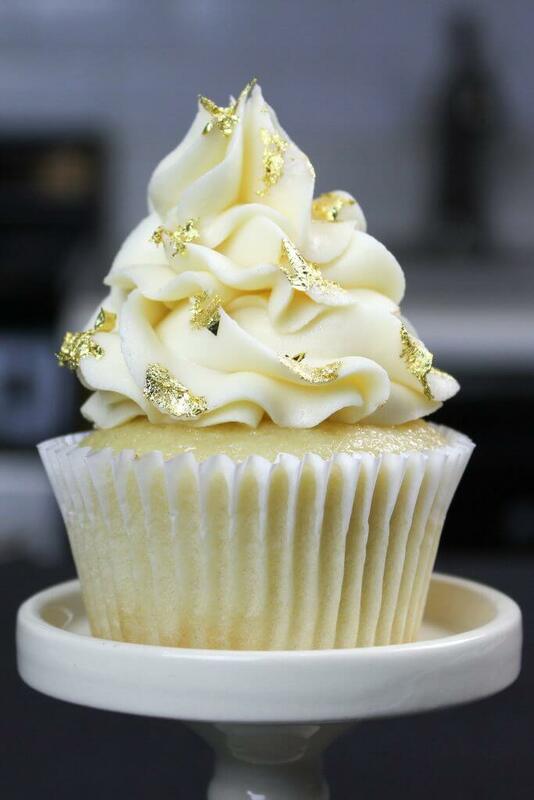 To do this, use a sterile paint brush to gently add the gold leaf sheets of 23k edible gold leaf. This easy vanilla cupcake recipe can be made in advance! They freeze very well, and can be made up to 2 weeks in advance if stored in an airtight container. I recommend waiting to frost and decorate them until the day you plan to serve them. They should come to room temperature within a couple hours. Your cupcakes need to be COMPLETELY cooled before you frost them! If they’re even a little bit warm, the frosting can melt right off. If you try this recipe, please tag me @chelsweets, and use the #chelsweets so that I can see your amazing creations! This easy vanilla cupcake recipe is insanely simple, and equally delicious! It comes together in one bowl, and makes super moist and fluffy cupcakes!! Add the flour, sugar, baking powder and salt to a large bowl, and gently combine with a large spoon. Pour in the buttermilk, and gently stir until just combined. The batter will be very thick, but that's how it should be! Next, add in the water, vanilla, egg and vegetable oil, and mix until the batter comes together. Fill the cupcake liners about 2/3 way full. Bake for 17 minutes, or until a toothpick comes out clean. Allow the cupcakes to cool for 5 minutes before moving them to a cooling rack to finish cooling. If you want to accelerate the cooling process, pop the pans into your freezer for about 30 minutes. Place the buttercream in a piping bag fit with your favorite frosting tip, and pipe large swirls onto the fully cooled cupcakes. Garnish as desired, then enjoy! This recipe can also be used to make mini cupcakes! This recipe makes about 40 mini cupcakes, which only need to bake for 9-10 minutes. Your recipes all look lovely! I’m baking cupcakes for work tomorrow, using your buttercream recipe can i frost them tonight and leave them out overnight or should i refrigerate? What would keep them fresh until tomorrow? Thanks im advance! I’m from an Asian country and I’m not quite sure as to our vegetable oil suits this.can you be precise at to what oil is it? Palm oil? I usually use vegetable or canola oil! Are these regular sized cupcakes, or are they the bigger sized? These are standard sized cupcakes! I used this recipe and made them lemon flavored instead and they came out amazing! I was just wondering if this recipe would work for a cake too? Hi Chelsea! I used your Baby Panda Vanilla cupcake recipe recently and now am comparing this vanilla cupcake version to the panda one. I see in this new recipe there isn’t any baking soda. Is that accurate? Wanted to check in because I am making 100 cupcakes for a wedding next weekend! Thank you! Can sour cream be substituted for buttermilk? I’m not sure, I’ve never tried it! But you can substitute regular milk in for the buttermilk! Greek yogurt works good in black of buttermilk. How would you recommend doubling the recipe to make 48 cupcakes? Your recipe doesn’t ask for any butter is that right? not in the cupcake batter! just buttermilk! i mix this by hand! I think you could also use a stand mixer though, just be careful not to overmix! Oil makes a lighter, fluffier cupcake! Just made these cupcakes… omg. Super easy and very yummy. I’m planning on making these for my daughter’s first bday. Are you able to make the cupcakes ahead of time and freeze (frosting later)? yes definitely! Just make sure they’re in an airtight container!! Made these tonight, they looked perfected, tasted great but were spongey almost like angel food, did I do something wrong? Like I said it was yummy!!! Hi Chelsea! I would like to know what brand of gold leaf sheets you used. Thanks a bunch! strange! maybe they were slightly under-baked? or over-mixed? Any recommendations to add strawberry flavor to these? I’d add in some chopped up, freeze dried strawberries! Can I use any other simple n easy topping or frosting than buttercream?? yah you can use whatever topping you like best! sounds like you need to cook them longer! Some ovens vary slightly from the temperature they say they are at, i would recommend testing your oven temp! Hey Chelsea! I was wondering is there a substitution for the 1/2 cup of water in the cupcakes? What does the water help with can you use more buttermilk instead? you can use buttermilk too! the texture will be a touch denser, but the cupcakes will have a great tang a be a bit more moist! Hi! I was wondering what brand and where do you get your food coloring? I want to make a frosting and dye it dark purple but I am always hesitant on my frosting tasting like food coloring. Also, do you use that same food coloring to dye your cakes too? I’ve been wanting to make red velvet but again hesitant on it. Hi! I love your recipes. I’m making these for easter dinner. One question: this recipe of buttercream also serves 12-14 standard size cupcakes? It really depends on how you’re frosting them! If you’re making large swirls, you’ll have a bit leftover, but it’ll be close to the right amount! If you’re doing small swirls or buttercream rosettes, you could frost about 2 dozen cupcakes! Thank you for sharing with us fellow bake-aholics! I really have enjoyed your videos. I’ve not used americolor gels before… are there any bitter tasting colors (i.e. : Red, Black, etc.) that you would recommend staying away from in the americolor line? of course, I’m always happy to share!! I think almost every red and black gel food coloring (no matter the brand) have a bit of an after taste! But americolor has a no-taste red food coloring which is better than the normal red! Hi. I’d like to try your vanilla cupcake recipe. I’ve been having a real difficult time lately with dense cupcakes. I follow the recipes exactly and each recipe I try is the same problem. HELP! The buttermilk in the recipe does make it slightly denser, but it shouldn’t be that different from the texture of a normal cupcake. If that really bothers you, you can replace the buttermilk with normal whole milk, which should lighten them up a bit! I have made a vanilla cupcake recipe before but it didn’t seem like the vanilla flavor came through enough. Could I add vanilla bean paste to add more flavor? Or what is your recommendation on adding more vanilla? definitely! I think paste is the best way to go to get an intense vanilla taste! Hi – have you ever tried using this recipe for cake pops? I haven’t, but it should work to make them! Do you have a regular chocolate cupcake recipe? If not, what all do I add to the vanilla recipe to make it a chocolate cupcake? I have a delicious dark chocolate cupcake recipe up, which is amazing!! I highly recommend trying it! Hi – Can I use this recipe to make cake pops? I tried this recipe several times and every single time it is as thin as water which does not make sense. At first I used a light buttermilk and figured it may be that, but then I substituted with whole milk and got the same result. I also tried using measuring cups first time and second time I weighed everything, but still have the same result. I used a brown organic egg, not sure if that has to do with anything either. Do you know what I could have done wrong? the batter is just on the thin side! but they bake up very well!! Sorry I am knew to your forum and didn’t realize I posted the same question twice. Do you recommend weighing vs measuring the cups? For example, when I measure 1 1/4 cup I don’t get 162g which is what your recipe calls for. Making from scratch cupcakes for the first time for my daughter and sons birthday this weekend. I just followed this recipe, line for line but both batches smell and taste like raw flour. Do you have any suggestions on what I’m doing wrong? That’s so strange!! every oven bakes a little differently, I’d recommend maybe baking them a bit longer? Or maybe trying a different flour brand? If I wanted to make alcohol infused cupcakes using this recipe… would you recommend I sub the liquor w the water? Can’t wait for your reply. Thanks! Yes, that is exactly what I’d recommend!! I made the recipe today, it tasted really good however it was VERY Lumpy. I had to sieve the batter.. what did I do wrong? I am curious as to what exactly makes this recipe different from the vanilla layer cake recipe you have..
Like what ingredients do what that you changed to get one recipe to bake more flat ? By the way, do you know if there is a difference in the cake when using low-fat vs full fat buttercream ? Just wondering can these cupcakes be coloured ? Has anyone tried substituting gluten free flour 1 for 1? Or any suggestions? Nope, but I would love to know if it works!! I’ve been meaning to test it out for a while! How did you make that deep red frosting without having the buttercream to seperate from its colors? Wish me luck! I will try to make these cupcakes for Easter breakfast for the community in our church in Jersey City! I pray I can pull this off. If not I’ll just buy in the store:(. I hope some day i will try one of your recipes!! I love how you make them and decorate them!! ?????? One question though: if i put olive oil instead of vegetable oil or canola oil, it will taste different? ? Thank you. Hi.. I tried this recipe and it came out great !! Super moist n fluffy !! Can you suggest an egg substitute for this recipe ? I made it substituting egg with 1/4 cup yogurt n it turned out kinda gooey/undercooked..I checked at 17 mins , toothpick came out sticky, baked for another 3 mins, still gooey n another 3 mins n still gooey..
Update – tried it with 1/4 cup buttermilk as substitute n got the same result. I thought maybe I’m over mixing it, so made another batch using buttermilk as substitute n very gently mixing.. still no luck.. Sadly I can’t seem to find the thread that this comment is responding to, but I want to help!! You substituted 1/4 cup of buttermilk in place of what? “I tried this recipe and it came out great !! Super moist n fluffy !! Can you suggest an egg substitute for this recipe ? I made it substituting egg with 1/4 cup yogurt n it turned out kinda gooey/undercooked..I checked at 17 mins , toothpick came out sticky, baked for another 3 mins, still gooey n another 3 mins n still gooey..
can i divide the recipe to make 6 cup cakes? How would i do so please? I used this recipe but added some thin raspberry jam and they were actually the most moist cupcakes I have ever had, they also taste so amazing!! ?? Hi! I’m a home baker and I use your basic vanilla cake recipe for all of my vanilla cakes, your chocolate recipe, etc etc!! Love your recipes. However, although I love the one bowl/no mixer cupcake recipe, I find they don’t separate from the cup without tearing the cake. Maybe I’ll try a different cups. Any other suggestions? Hi there! Love all of your recipes I’ve tried so far….thank you for sharing them! Unlike Jill, I don’t have a “tearing” issue but mine tend to shrink and some actually pull away from the wrapper. I do use my convection oven and drop the temp to 325 degrees but as I’m typing this I’m wondering if I tried baking without the fan at the temp you recommend if that will make a difference. I probably should have tried that before reaching out to you. 🙂 Anyway, any suggestions that you may have is much appreciated. haha I’m literally laughing out loud reading this Kimberly!! You’re too funny! I would say try it without the fan at 350, and see if that fixes the issue. Hopefully it will 🙂 Let me know it goes, I’d love to know! !